This gas-electric tower car was built by English Electric in 1928 for Montreal's National Harbours Board as #44. 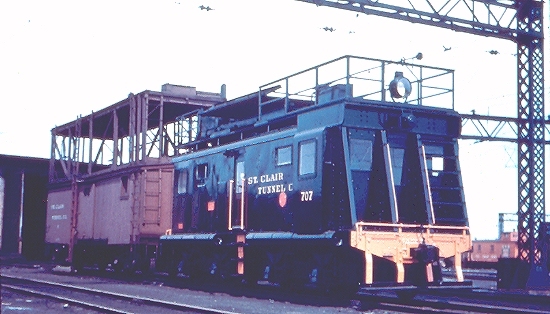 It was acquired by Canadian National Railways in 1941 for the St. Clair Tunnel Company and numbered 15707. In 1950 it was repowered by a diesel engine and renumbered 707. It was again renumbered 15707 in the early 1960's. at the CNR MacMillian Yard in Toronto, Ontario. 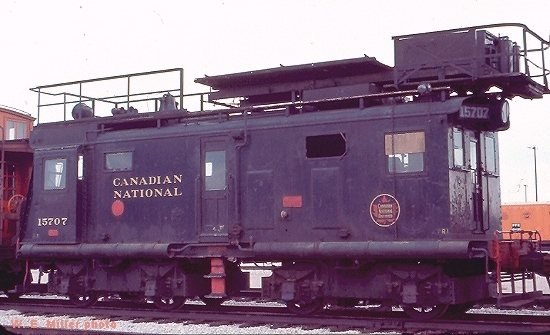 CNR 15707 was retired June 5, 1968 and scrapped in Montreal, Quebec.